I started my professional life as a social worker in a hospital and after several fulfilling years I stayed home to raise my kids. Little did I know how much my previous work as a hospital social worker would help me raise children, particularly my son with a Jewish genetic disease who has many medical problems. It gave me a unique insight into both sides of the hospital bed – as the helpful professional and the hands-on caregiver. As the years passed I had little interest in returning to social work as a career. I had enough problems of my own – I didn’t feel like hearing other peoples’ problems for a living. Sure, I like to think of myself as a good friend and am happy to offer my unprofessional advice when asked. But I am content to quietly deal with my own stuff while grabbing happiness when I can. After my mother died I started writing, something I had not done before. My sister encouraged me to start a blog so I gave it a shot. A friend who is a professional writer and teacher suggested that maybe it was my mother’s legacy, as my grief over her loss led me to put my thoughts to paper. My mother was an incredibly thoughtful and kind person; I loved the idea of helping others through my writing as a way to honor her memory. The response to my blog was very positive. It turned out to be a great way for me to work through thoughts and issues that I grappled with and it seemed that people liked hearing what I had to say. I am inspired by people I know who take chances and try new things in middle age, who fully embrace the saying that life happens outside of your comfort zone. People I know and admire have done really interesting things: started a Jewish acapella group, volunteered to be the president of an overnight camp board of directors, took a stand-up comedy class, became a hospice volunteer, and a volunteer advocate for children in the court system, became a health coach/nutrition expert, and a mentor to a teenage mother hoping to complete a college degree. Another friend who has been a lawyer for years is now working towards becoming a high school English teacher. Who knew that a friend and I would become leaders as part of a international women’s’ trip to Israel, helping women to rediscover their Judaism and connection to the land of Israel? My writing led me to explore storytelling after my husband turned me on to a podcast called “The Moth” on which people tell true stories without notes. I had little public speaking experience but on a whim, I signed up for a storytelling class in the spring. It was in downtown D.C. and I knew no one in the class. The final class was a small performance for friends and family. I loved it so much that I decided to put my name in a hat at a Moth “Story Slam” in DC., which is an open-mic storytelling competition open to anyone with a five-minute story to share on the night’s theme. I had one of my teachers coach me and I felt well prepared. I arrived that evening, put my name in the hat and then almost had a panic attack as the theater was filling up with hundreds of people. What had I done? I sat in the audience, not knowing if my name would be called. After the first story, my name was announced…show time! I bounded up on stage and told my story. It was terrifying and exhilarating but I was thrilled when it was over and felt so proud of myself. 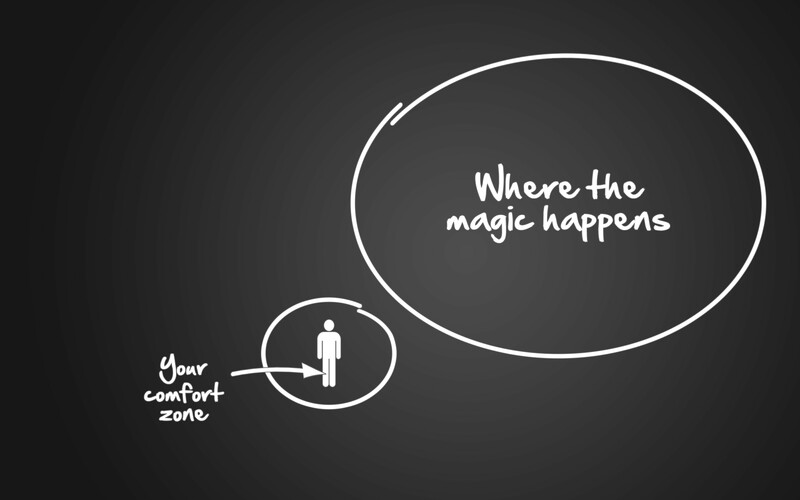 Out of my comfort zone indeed. It was a great place to be. Here is the story I told that night. I didn’t actually win although I came in a close second. I felt like a winner anyway. The theme of the night was “Karma.” Turns out being uncomfortable isn’t always so bad….I highly recommend it.